The first time my newborn son peed on our comforter as I was changing him, I was horrified. We lived in a tiny apartment, and his changing table was right next to our bed, so the distance was nothing for a little boy. I bundled him up, stuffed the comforter in a garbage bag, and hauled everything down the street to the laundromat so I could properly wash the thing. The second time he pulled that stunt, I decided it wasn’t worth the trip to the laundromat, so I simply got out my disinfectant spray and scrubbed the spot. By the third time he did it, I just swiped at it with a baby wipe. Now, 10 years later, we still have that comforter, and it has seen its share of use. There are spots and pen marks and even a nice mauve blotch from a nail polish accident that happened a month ago which I have yet to attempt to remove. You see, I’ve learned something over the years- some things just aren’t worth the fuss. Anyone who has kids can tell you that they change your life in many more ways than expected. Well beyond the different schedule and new wake-up times, kids change your perspective entirely. My standards have lowered a lot since my first child was born, as anyone who has visited my house lately can tell you. Even as I write this, my back is turned so I can’t see the Little People village scattered all over our living room floor, making it more like a mine field to navigate. But I can’t turn my back on the Toy Story Memory game cards spread out on the table before me, left over from a game started yesterday before my daughter got bored with it. 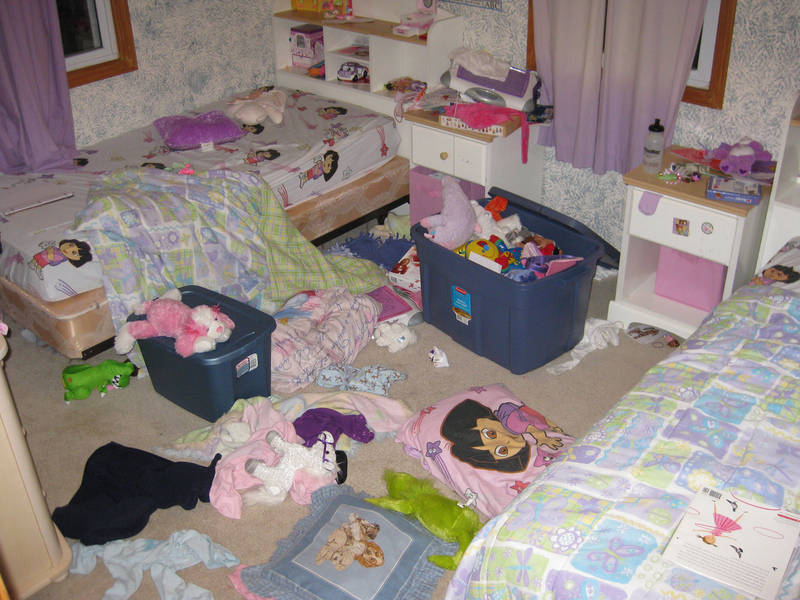 When my first child was a toddler, I distinctly remember coming down every night and dutifully putting away all the toys so we had a fresh start the next day. Now I don’t bother with that anymore. My 25-year old self would be appalled at my 35-year old self. (Talk about letting myself go…) But I have come slowly to realize that there are more important things than a clean house. And I owe that lesson in part to a grandparent’s perspective. If you think about it, most grandparents don’t worry about the state of their house when their grandkids are there visiting. Oh, sure, there are exceptions to that, but by and large, most grandparents are more interested in spending time with their grandchildren than they are with keeping the toys picked up off the floor. Especially if grandparents live far away and don’t get a chance to see their grandkids very often, playtime is far more important than a clean living room. Grandparents are often more willing to do things at a child’s pace. They don’t mind going for a slow walk with a 3-year old, stopping to look at dandelions and rocks with fascination. They don’t mind getting down on the floor to build Legos with their grandchildren, scattering Legos into every corner of the room. They don’t mind leaving a kitchen full of dishes while they go outside to watch their grandchildren play badminton or draw with sidewalk chalk. But why? Because they know that this time with their grandkids is temporary. Unless they all live together, their grandchildren will leave at some point, leaving them an empty house and the time to clean up whatever messes were left. This perspective of the temporary nature of the visit compels them to make the most of each visit. Plus, they have seen their own children grow up and leave the house, reminding them all the more of how fleeting time is. How does this translate for those of us who still have young kids? Remind yourself of a grandparent’s perspective- this time with your kids is temporary. Oh, I know some days seem like they’ll never end, and believe me, I’ve had my share of “mommy meltdowns” where I yell, “Am I the only one in this house who even tries to clean?! ?” There are always chores that can be done- laundry to wash and fold, dishes to clean up, bathrooms to clean (often multiple times a day…). And I’m not suggesting here that you abandon cleaning entirely. Get your kids involved in the process and spend time with them as you clean. But every once in a while, turn your back on the constant chores and allow yourself to “babysit” your own kids. Babysitters are there for one purpose- to watch the kids. You don’t hire a babysitter to clean your house. So when they’re babysitting, they play with the kids and have a great time. Allow yourself to do the same. Remind yourself of a grandparent’s perspective- this time with your kids is fleeting. They won’t always want you to play with them or watch them. Cherish that time while you have it. Give yourself permission to leave the chores for later and play a game with your kids, dance with your preschooler, or build a blanket fort. And yes, every now and then even set up an appointment to give yourself and your daughter a matching pedicure. Just not on the bed. I enjoyed this post. With only one (and him not fully mobile) I probably still have delusions of clean-house grandeur.